I think that critical reviews of failed design can be very eye opening but design critique can sound sound harsh and negative. There haven't been a shortage for high profile bad designs lately, especially in iOS to Android porting section. 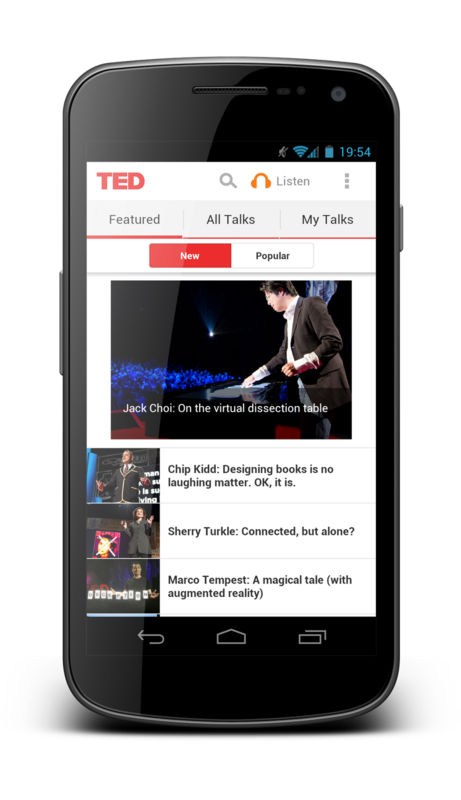 Although it might sound so current state of Android app design is not bad. Looking back for one year the quality improvement has been amazing. Android users have also became more demanding. While still year ago even badly designed apps rared very high on the Android Market (now Google Play) now users demand more. In this post I'm looking at one app that delivers almost unmatched quality on both Android phones and on Android tablets. I'm talking about TED! 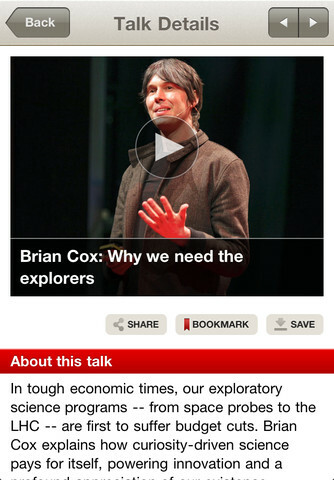 The TED app has been available for iOS for some time already and delivers on that platform too. Refreshingly the designers and developers of this app knew what they were doing when porting and redesigning the experience for Android. The app matches Android UI guidelines almost completely. 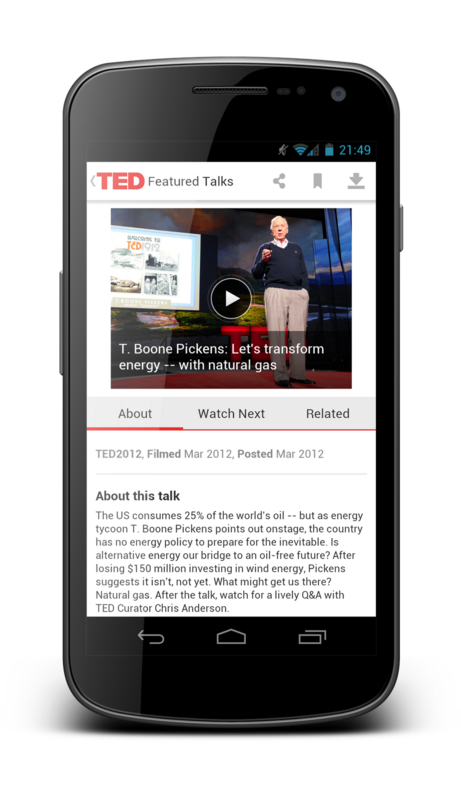 It looks very much like Android app should and it scales well to larger screen. 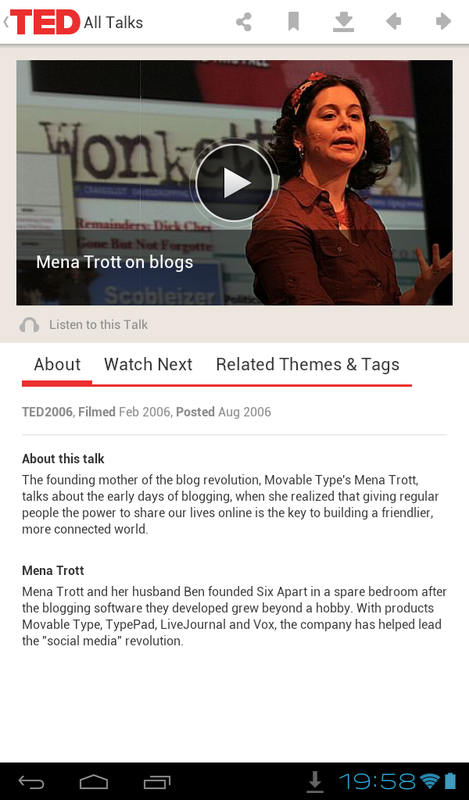 The TED app utilises Android UI design pattern wherever applicable. 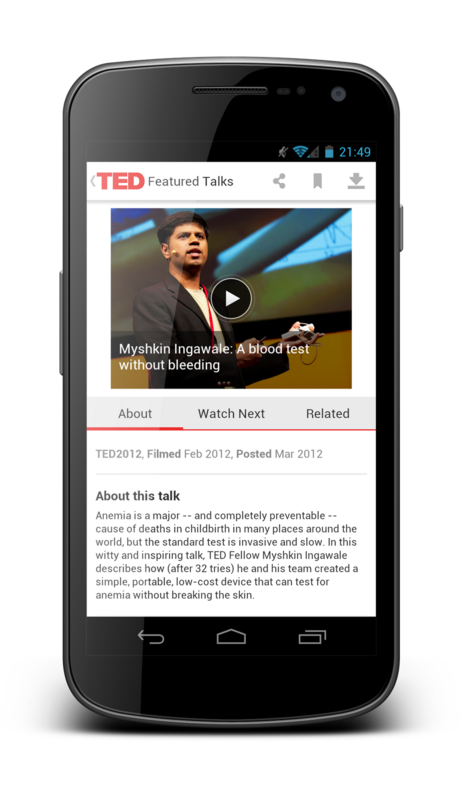 They fully utilise Android action bar, tabs, split views and share intents. We have recently seen few failed iOS ports. It is very refreshing to see an app that has a great UI on iOS having a great UI also on Android. For comparison here's screenshots of the app on iPad and iPhone (thanks Ravi Vyas). The app feels nice. Interactions feel effortless and satisfying. 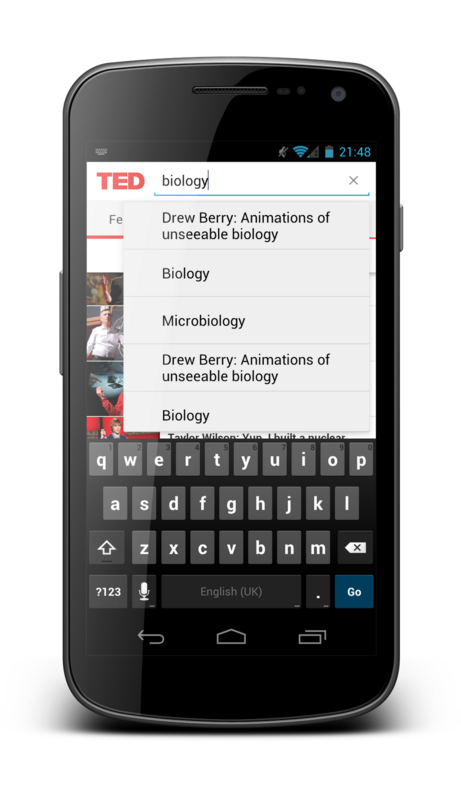 Navigation by swiping is supported throughout the app. The app looks very Android-app-like. Visuals follow Android guidelines with flat colour theme and use of Android platform icons and components. The app is mostly clear from unnecessary clutter. The interface is clean and easy to use. When using the app you have the feeling that it tries to help you as much as possible. For example, when searching your search term does not have to be specific and you will most likely find what you are looking for. They have also kept the setting very simple. Everything that is needed is there and nothing more to distract and confuse users. I've written a separate post about this issue before. 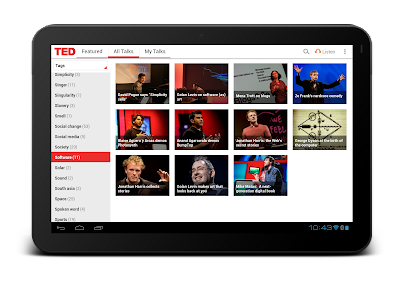 This app is a perfect example what Andy Rubin said when he talked about Android Tablet apps. The same app works well on phones and tablets. Not only that, this app works great on small phones, large phones, small tablets and large tablets. The design is scalable. Here's how the app looks on 4.65" phone, 10.1" tablet and a 7" tablet. 10.1" ICS tablet portrait & 4.65" ICS phone portrait. 7" ICS tablet portrait and landscape. 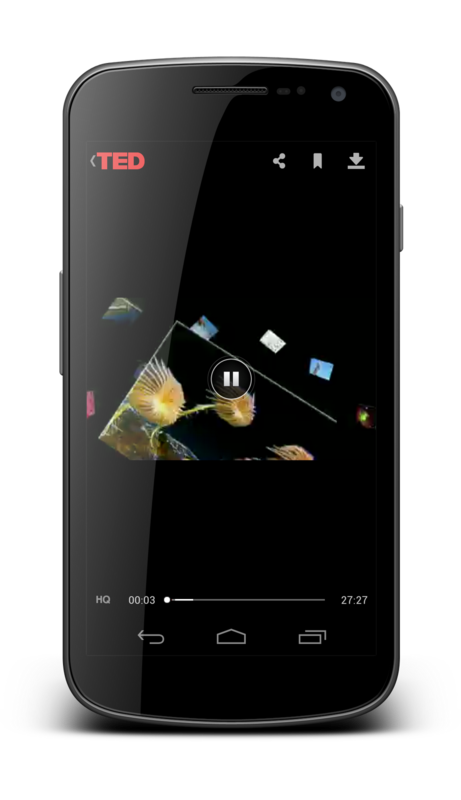 The app supports offline watching of the videos very nicely. When the download is in progress you see a notification telling you that it's going on in the background and once the video is downloaded it is added to a list of offline videos. Evan the best apps aren't perfect. 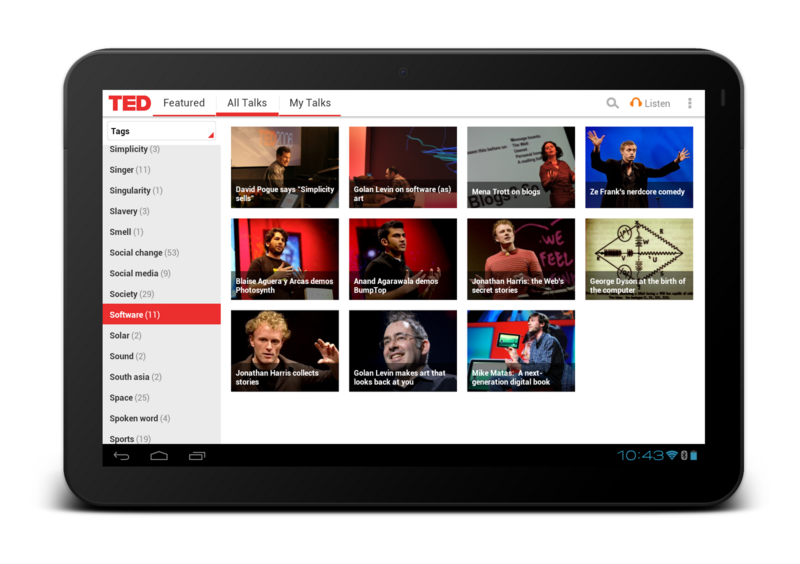 TED app has few problems. Navigation model of the app has three levels. They have chosen to place them in the UI as a one stack. Too many navigation controls visible at once can cause confusion. Marie Schweiz pointed out some of these issues in this G+ discussion. My biggest gripe with the app is lack of landscape mode on phones. It is hard to understand why it isn't there. Landscape works really well on 7" tablets. It is going to feel strange to users while watching the videos in landscape mode is possible rest of the UI is forced portrait. This should be fixed. Always provide landscape mode on all devices. Some phones are primarily used in landscape especially if they happen to have a physical keyboard. I also would advice them to provide means for users to cancel the video downloads. It doesn't seem to be possible currently. Tapping the download notification should take the user directly to a screen where they can cancel it. 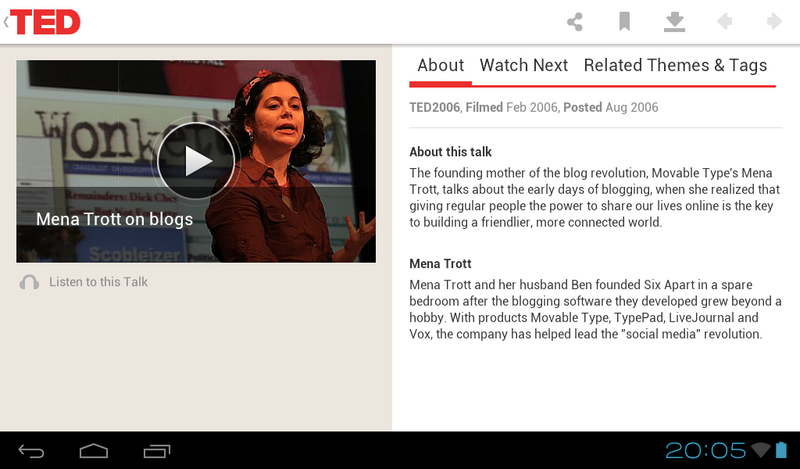 Ted app is awesome. There's no other word for it. Not counting the few problems they have the app is the benchmark of current Android design. Whenever people ask you for an example of how Android apps should look like just give them this URL https://play.google.com/store/apps/details?id=com.ted.android. 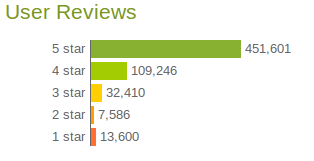 I will now start waiting for the imminent release of the next GigBeat app version. Judging by the beta releases they have a real good chance reaching as good results as TED has done or even better.